Oh, I love Christmas decorations. And I love mine. It is so fun to open them up every year. This is one of my favorites. I don’t remember where I got it, but I love it. A sleigh for today’s Friday Photo. Do you have a favorite Christmas decoration? This entry was posted on December 8, 2017 at 7:08 pm	and is filed under Friday Photo. 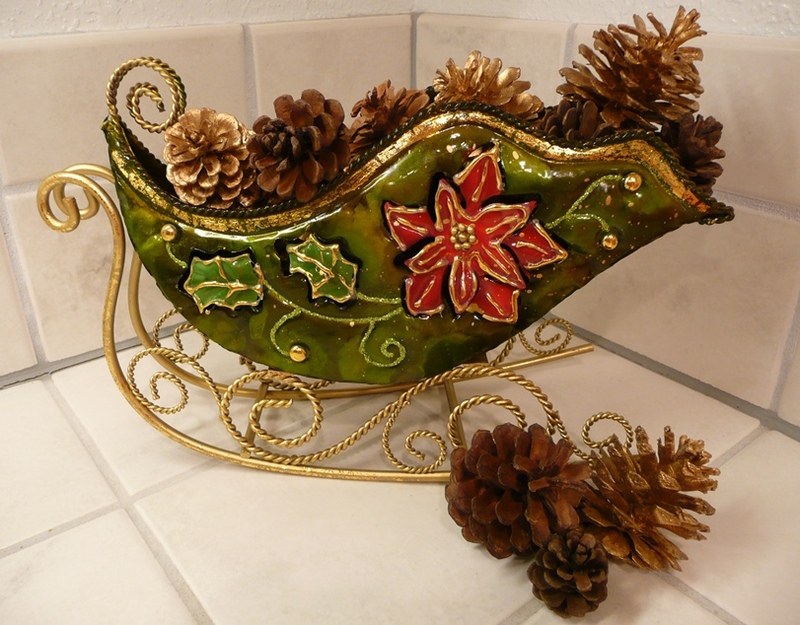 Tagged: Christmas decoration, Friday Photo, metal sleigh, pine cones. You can follow any responses to this entry through the RSS 2.0 feed. You can leave a response, or trackback from your own site. Beautiful I decorating for Christmas. I think it works. Thank you! I love my antique Christmas ornaments, but I also love my Coco Cola Santa Claus.